adidas is following up on the huge launch of the Predator 18+ with the rest of the Skystalker Pack, introducing the X, the Nemeziz, the Nemeziz Messi, and the brand new Copa 18 in an updated colourways. And wow, how good does that X look? Last week, adidas revealed the comeback of an icon. The Predator is back in form of the Predator 18+, a highly innovative and modern boot with inspiration from the past. Thus, with the Predator taking its place, the popular adidas ACE will not be released anymore. 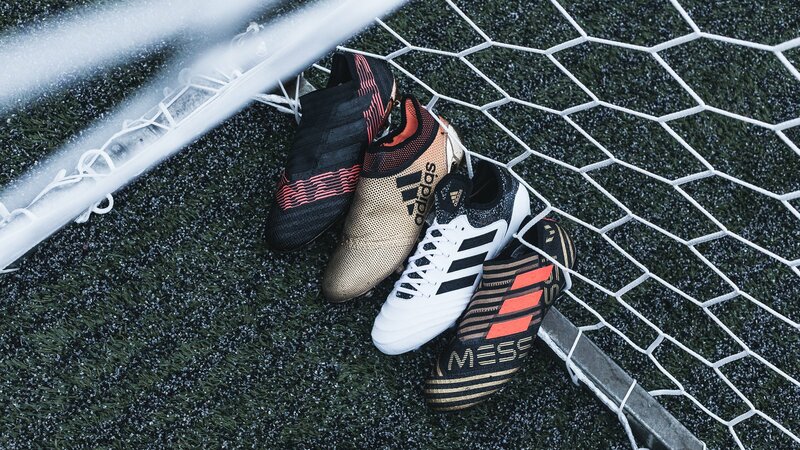 This means that the Skystalker Pack introduces the new adidas line-up, starring the Copa 18, Nemeziz 17, Nemeziz Messi 17, Predator 18 and X 17. The Predator is back! Read more about the adidas Predator 18 right here. The Skystalker leaves no cage unplayed in. No trick concealed and doesn't miss the chance to show up and show off. He's a daytime dominator with a keen eye, always analysing the cage and its surroundings with almost eagle-like focus. Think you can get past him unnoticed? Think again. With the introduction of the new Predator boot, adidas has also released a new ‘pack theme’. Since the first release of the Nemeziz, adidas has named the brand’s boot packs after naturally occurring storm phenomenons. However, as the Skystalker Pack is inispired by one of nature’s predators, this might just be the beginning of another pack theme. Let's start off with possibly the most fire boot of them all in the Skystalker Pack, and perhabs of the year. Predominantly gold, the adidas X 17+ PureSpeed still features the polka-dot style of the first X 17 cleats, with the dots fading from black in the front towards gold metallic in the rear. Tech-wise, the X Skystalker retains everything that made the previous colourways so popular. The Predator isn't the only brand new boot in the adidas Skystalker Pack. The Copa is updated to the Copa 18, and the Skystalker Pack features its debut paint job. The Copa 18.1 is predominantly white with a black trim, multicolor Primeknit in the rear and a bit of gold, both to round it off in a classy way and to connect it with the rest of the pack. Tech-wise, the adidas Copa 18 boots are very similar to the 17.1, both in shape and also in the materials that are used. However, Copa 18 cleats only combine two kinds of upper material - the entire rear of the model, including the tongue, is made of Primeknit, while the rest of the boot is covered in the soft and flexible kangaroo leather. The X is not the only boot that gets a golden touch. Both the Nemeziz 17+ and the Nemeziz Messi 17+ feature gold, but in different ways. Since the Nemeziz Messi is the signature boot of, well.. of course, Lionel Messi, the predominantly black boot deverses a stroke of gold. The Nemeziz Messi boot features gold striping all around the upper, creating a much more eye-catching look overall. Additionally, a bit of red is present in the form of the lateral 3 Stripes. Created for the supernatural agile player, the Nemeziz 17+ 360Agility might even be better looking than the Messis, featuring a stunning design with a metallic golden sole plate and golden applications. The Nemeziz has matte black adidas stripes, while Solar Red is used for a single part of the silo's trademark bandage-like upper design. Like the X, both the Nemeziz 17+ and the Nemeziz Messi 17+ stay true to the former versions when looking at the technologies. This means that you'll still get the Agility Knit 2.0 forefoot for increased touch in all weather conditions and a Dual Lock collar for ankle stability, as well as the Gambatrax for the Nemeziz Messis. Do you want the Copa 18, Nemeziz 17, Nemeziz Messi 17, Predator 18 or the X 17 from the Skystalker Pack? Get your pair right here.